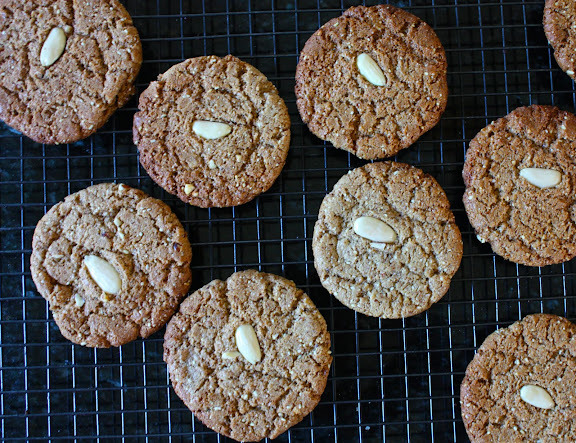 These cookies are crunchy, yet not dry or hard. Sweetened with brown sugar and honey as opposed to white sugar, the cookies are not cloyingly sweet. The brown sugar helps keep the cookies somewhat moist, and the honey, being an inverted sugar, also helps keep the cookies from being too hard and brittle. 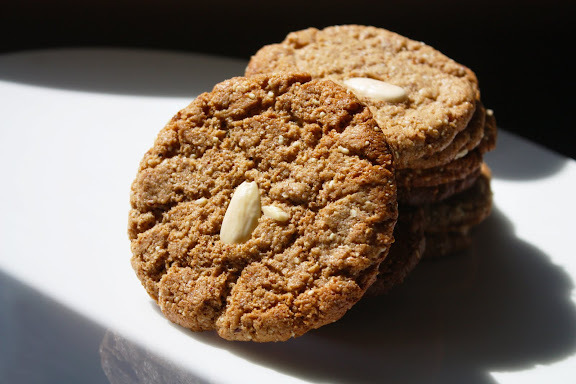 This recipe requires that you use natural, unsweetened, and unsalted almond butter. (You can make your own by grinding up raw, skin-on almonds in a food processor until you get semi-smooth almond butter. Whether you make your own almond butter or use store-bought almond butter, be sure to discard the oil that collects on the top of the butter before measuring or weighing it for the recipe. Preheat the oven to 350° F. Line two cookie sheets with parchment paper; set aside. With an electric mixer, blend together all ingredients until you get a sticky and somewhat greasy mass. Make 18 balls, about 1 1/2 inches in diameter, out of the batter. Flatten each ball and shape it into a smooth-edged little hockey puck with approximately 1.5 inches in diameter. Arrange the hockey pucks onto the prepared cookie sheets. Keep in mind that, containing a considerable amount of (good) fat, each 1.5-inch hockey puck will spread into a 3.5-inch disk, so allow enough space between the cookies so they don’t run into each other. Embed one blanched almond into each hockey puck, right in the middle. Place the cookie sheets on the racks, positioned in the middle of the oven, and bake for 12-15 minutes or until the cookies turn medium blond, rotating the pan once half-way through to ensure even browning. Remove the cookies from the oven and let them cool completely right on the pans. Store the cooled cookies in an airtight container. *Even more so with yellow food dye added. But I just don’t see the point. Wow, they’re based almost entirely on almond butter! I haven’t seen a gluten free recipe like this before. Have you made them on peanut butter too? I’ve made these about 3-4 times now and I can’t thank you enough for this fab recipe!! I’ve been using whole, raw, unsalted almonds and pulverize them in my grinder to make almond flour (instead of using almond butter). Sometimes I’ll let it go a little longer to get a less fluffy consistency (so the almond flour clumps a little). I may put in a heaping tablespoon of peanut butter or almond butter and find using 2 cups of my homemade almond flour is best. I also use one tbsp of the honey and one tbsp of agave nectar and use the Splenda brown sugar blend to cut down on the sugar. I also use this as a base for a chocolate cookie recipe – using cocoa powder (which is good for you) and maybe a heaping tablespoon of nutella. Elaine – (Bowing in gratitude in your direction) Thank you so much for dropping by and sharing with us these tips. Now I want to make a batch myself!